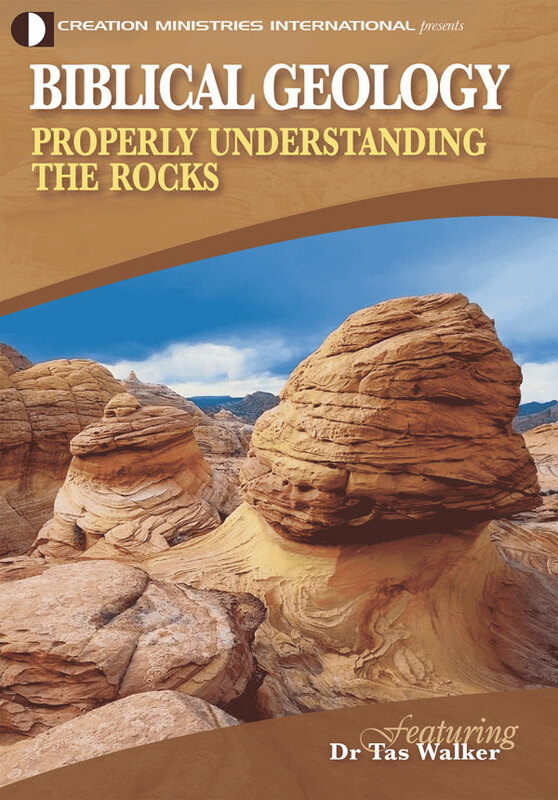 Marcus Ross and I agree it is important for creationist geologists to discuss how they have linked geological evidence to biblical history, and resolve their different conclusions. I appreciate Marcus’s paper, which documents his thinking, and his involvement in these subsequent discussions. To recap, Ross, in “Evaluating potential post-Flood boundaries”, used a biostratigraphic analysis to argue that a Flood/post-Flood boundary at or near the Pliocene/Pleistocene was untenable.1 He argued the analysis indicated the Cretaceous/Paleogene (or K/T) is the highest possible post-Flood boundary. The location of the Flood/post-Flood boundary is an important issue for Flood geology because it is the starting point for a host of research questions. 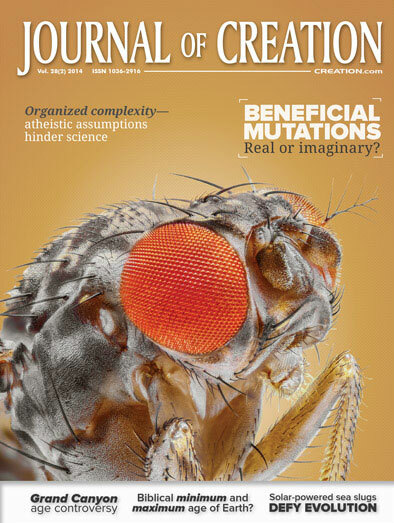 Many papers have been published on this topic, but its placement is still controversial. Three main views are advocated: a low Flood boundary in the Paleozoic or below, a boundary at or near the Cretaceous-Tertiary boundary (now the Cretaceous/Paleogene boundary), and a variable boundary towards the upper Cenozoic but with each geographical area to be evaluated on its merits. 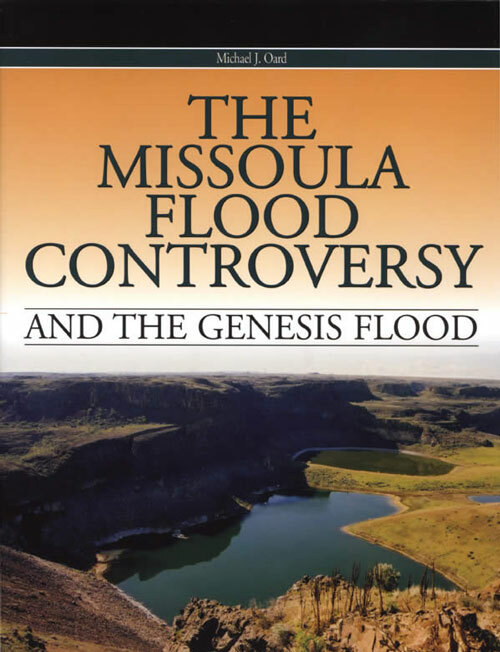 In 2012, Marcus Ross, published a biostratigraphic analysis and argued that a Flood/post-Flood boundary at or near the Pliocene/Pleistocene on the geological column was untenable, and that the Cretaceous/Paleogene (or K/T) is the highest possible post-Flood boundary. In a brief letter exchange, Tasman Walker argued that the palaeontological data is biased by hidden assumptions, making Ross’s conclusions on the boundary premature. In my letter, I said that while the analysis was carefully done, the approach was flawed by the hidden assumptions in the ‘data’. 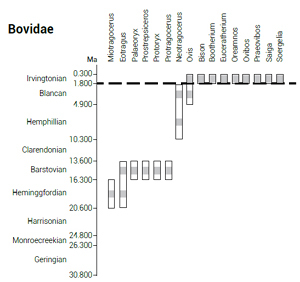 Namely, the classification of the fossils in the paleontological database to the geological column had been heavily influenced by evolutionary, long-age criteria. The geological processes that long-age geologists envisage are inconsistent with the processes operating during the global Flood. In his response, Ross assures us that, as a qualified Ph.D. palaeontologist with much experience with mosasaurs, he can personally “speak to the reliability of collection records”. Yet, not all palaeontologists are this confident. British palaeontologist Derek Ager, contributor to Moore’s Treatise on Invertebrate Paleontology, said, “There is much subjectivity in systematic palaeontology.”2 He also highlighted the problems caused because palaeontologists specialise. For example, those working in the Palaeozoic often used different names from those working in the Mesozoic. They also had different classifications, different methods of study, and different terminology for anatomical parts.2 Ager also noted a peculiarity that some fossil distributions tended to follow national borders.2 These are some of the issues with the database Ross used, and they need to be resolved before we can draw firm conclusions from the analysis. What does geological correlation over long distances mean? Ross argued, on the basis of his research with late Cretaceous mosasaurs, that sediments can be correlated over long distances. He described how sediments containing mosasaur fossils from New Jersey, US, had similar features (e.g. fossils, shocked quartz due to impact, anomalous clay deposits, and elevated iridium levels) to sediments in the Netherlands in Europe. He claims this proves sediments can be correlated over long distances. The features that Ross mentions (shocked quartz and iridium-rich clay) were part of the evidence Luis Alvarez presented in 1980 for his meteor-impact hypothesis for the extinction of the dinosaurs. Others have since noted that iridium enrichment can be caused by volcanic eruptions, and that iridium-rich layers are not such precise time markers as originally claimed. Further, there were many impacts during the Flood,3 and so which impact or impacts contributed to which iridium layer? And the planar deformation features in quartz called ‘shock lamellae’ are not always caused by shock deformation but can be caused by volcanism, or by prolonged pressure from tectonic activity.4 So, there are many issues to be addressed. Even if we accept that a long-range correlation has been established, what does that mean? Were the sediments in the US and the Netherlands part of the same depositional basin? Were they deposited at exactly the same time? Long-age geologists decided that they were and assigned them both to the Maastrichtian of Late Cretaceous on the geological chart—72.1 to 66 Ma ago by their thinking.5 But how does that translate into the events of Noah’s Flood? Were they deposited on the same day or the same week during the Flood? Was it early or late during that year? Were the waters rising or falling? 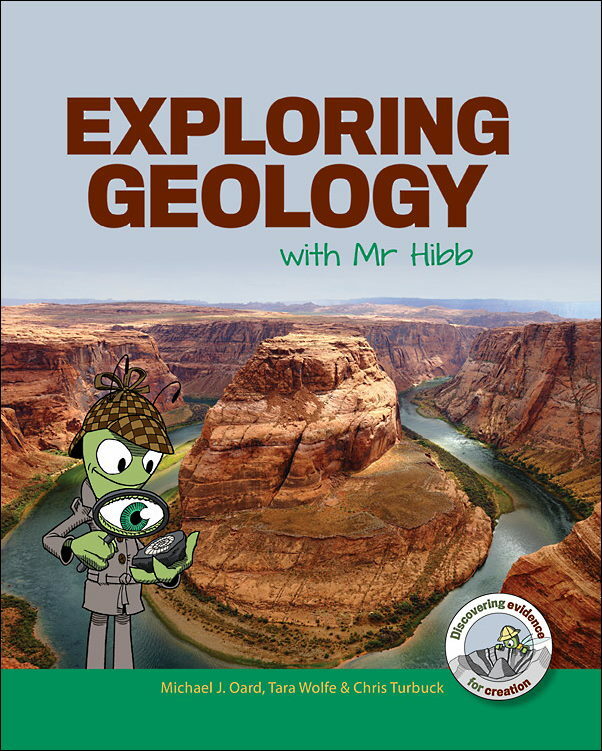 These sorts of issues illustrate the risks of using fossils classified into a secular database without critical examination of their geological setting. Figure 1. Biostratigraphic fossil distribution of the North American Rhinoceratidae (rhinos) from Ross.11 Click for larger view. Speaking of long-range correlation, I was happy to work with the secular correlations for the Cretaceous sediments of the Great Artesian Basin, Australia,6 because they were largely based on continuity of physical properties on the one continent. Geological formations in this basin can be matched over thousands of kilometres. My analysis of the physical characteristics of the basin places its deposition as the waters of Noah’s Flood were rising on the earth, around the time they were reaching their peak.6 On the other side of the continent, an analysis of the fault patterns on geological cross-sections in the Perth area, Western Australia, indicates that the mid Cretaceous marked the time during the Flood when the continents began to rise and cause the waters covering the continent to recede into the ocean.7 The sediments in Western Australia and Queensland have both been classified as Cretaceous but they are not physically connected. However, they both appear to have been deposited as the floodwaters were peaking, but not at exactly the same time. The mosasaur fossils that Ross researched were assigned to the Cretaceous, which, according to the analysis mentioned above,6 is the general timing when the waters of Noah’s Flood were peaking. After this, the waters receded from the continents eroding kilometres of previously deposited sediment.8 This period of erosion on the continents during the Flood is well recognized by long-age geologists, but its Flood significance is not appreciated. It was highly energetic, beginning as a period of sheet flow and ending with a period of channelized flow.9 The combination of receding water, changing flow patterns, falling sea level, rising continents and emerging landscapes created a complex situation of erosion and deposition during this time. Long-age geologists do not recognize these geological processes because they do not believe Noah’s Flood happened. Consequently, their classification of Cenozoic sediments can be highly inconsistent with the timings of the Flood event.10 In other words, the physical depositional processes for ‘Cenozoic’ sediments is different from those of the Mesozoic. That is why we cannot just take their fossil database and expect to reach a clear, unambiguous conclusion. We need to go back to the original data as I outlined in my first letter. Let’s take a preliminary look at a couple of graphs Ross published with his paper. 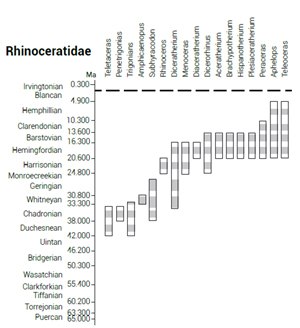 His figure for North American rhinos (his figure 12 reproduced here as figure 1) shows they range from 42 to 4.9 Ma,11 when they supposedly became extinct in North America. As this graph stands, a Pliocene/ Pleistocene post-Flood boundary (somewhere near the dashed line)12 works well with this data. These fossils can be interpreted as Flood deposits (likely as the floodwaters were receding, if the Cenozoic represents the peaking of the Flood) leading to the idea that these rhinos perished during the Flood and were buried as the waters were receding. The absence of later fossils suggests that the rhino populations that dispersed from the Ark in the Middle East did not reach North America. We will look at another of Ross’s figures, the family that includes cows and bison (his figure 4 reproduced as figure 2). Their fossil range extends from 20.6 to 0.3 Ma. If the dashed line at the Pliocene/Pleistocene boundary represents the post-Flood boundary,12 then the seven genera to the left of the graph would represent animals buried during the Flood as the floodwaters were receding. The eight genera to the right of the graph above the dashed line would represent animals that migrated to North America after the Flood. In other words, these genera present no problem with the dotted line being the post-Flood boundary. Figure 2. Biostratigraphic distribution of the North American Bovidae (cows, bison) from Ross.11 Click for larger view. However, of particular note is the one genus (Ovis) that crosses the dashed line. Ross argues that such crossings make the boundary at the Pliocene/Pleistocene untenable. This is a premature conclusion. It simply indicates more investigation is needed in this area. 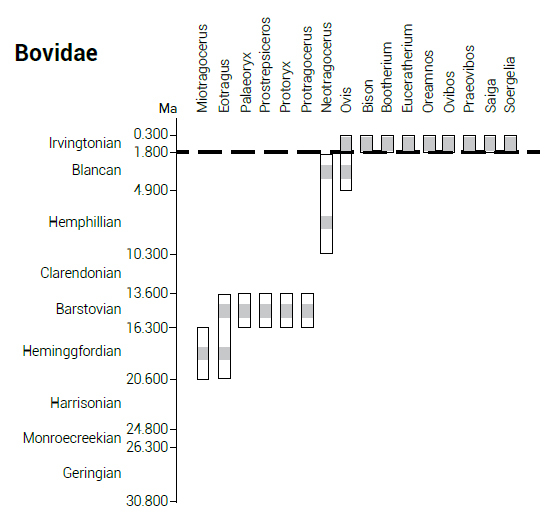 Observe that there is a noticeable paleontological gap of between 13.6 and 1.8 Ma, with fossils from only two genera in that region. This gap is the sort of fossil discontinuity that would be expected around the post-Flood boundary. One possibility with the ‘boundary-crossing’ genus, Ovis, is that the genus includes several different species, some of which are pre-Flood, and others that are post-Flood. That would still be a distinct discontinuity. A second possibility is that one particular species within the genera existed before and after the Flood. Some members were buried in that area during the Flood, while others returned to North America and were buried post-Flood. While we would not expect this situation to be common, we accept that it would happen occasionally. A third possibility, one that is likely, is that the long-age geological classification of the Cenozoic sediments to the geological column is inconsistent. A fourth possibility is that the identification of the fossils is faulty. All this demonstrates the need to thoroughly examine the basic data. The other graphs in Ross’s paper show many more ‘boundary-crossing’ genera, highlighting areas that need to be investigated in a similar way. In summary, Ross has provided a good service to the creation community with his biostratigraphical paper. When we examine his graph for the rhino family we find it is entirely consistent, as presented, with a late-Flood boundary. The graph for the family that includes cows and bison is also, apart from one genus, consistent with such a boundary. The one ‘boundary-crossing’ genus indicates the area where further research is needed to determine which, of multiple possibilities, applies in this case. His graphs for other families show other genera that cross the hypothetical dashed line, highlighting other areas that need research. Ross’s dismissal of a post-Flood boundary near the Pliocene/Pleistocene is not supported by the research he presented because 1) the post–Flood boundary likely cannot be represented by a single line on the column as he shows, and 2) the relevant ‘hidden’ detail of the paleontological data has not been properly assessed. 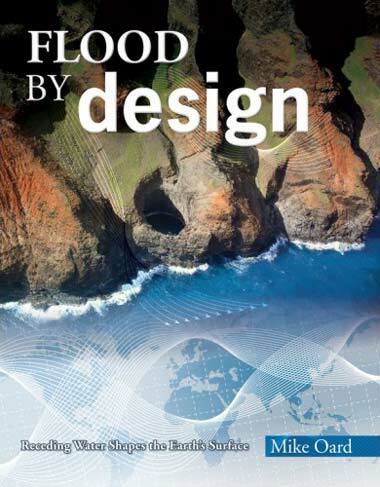 Creation in-depth: Where is the post-Flood boundary? The K/T impact hypothesis and secular neocatastrophism—why is this important to Flood geology? Ross, M.R., Evaluating potential post-Flood boundaries with biostratigraphy—the Pliocene/Pleistocene boundary, J. Creation 26(2):82–87, 2012; creation.com/biostratigraphy-post-flood-boundary. Return to text. Ager, D., The Nature of the Stratigraphical Record, The MacMillan Press, London, p. 17, 1973. Return to text. Oard, M.J., How many impact craters should there be on the earth?, J. Creation 23(3):61–69, 2009. Return to text. Officer, C. and Page, J., The Great Dinosaur Extinction Controversy, Helix Books, Reading, MA, 1996. Reviewed by Wieland, C., Book review: The Great Dinosaur Extinction Controversy, J. Creation 12(2):154–158, August 1998. Return to text. International Chronostratigraphic Chart, International Commission on Stratigraphy, January 2013; stratigraphy.org. Return to text. Walker, T., The Great Artesian Basin, Australia, J. Creation 10(3):379–390, 1996. Return to text. Walker, T., Perth area, Western Australia: Recessive Stage of Flood began in the mid-Cretaceous and eroded kilometres of sediment from continent, J. Creation 28(1):84–90, 2014. Return to text. Oard, M.J., Is the K/T the Post-Flood boundary?—part 1: introduction and the scale of sedimentary rocks, J. Creation 24(2):95–104, 2010. Return to text. 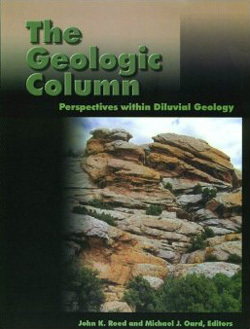 Oard, M.J., The geological column is a general Flood order with many exceptions, J. Creation 24(2):78–82, 2014. Return to text. Ross, M., Evaluating potential post-Flood boundaries with biostratigraphy—the Pliocene/Pleistocene boundary, Online supplement at: creation.com/pliocene-pleistocene-boundary. Return to text. I use this ‘boundary’ for the purpose of discussion, but we cannot assume that a single location on the geological column represents the same stage of the Flood (e.g. the Flood peak or the post-Flood boundary), as this dashed line suggests. Return to text. 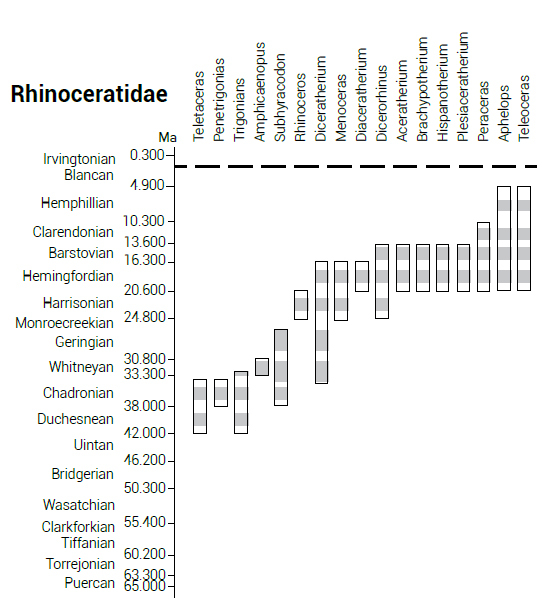 Prothero, D.R., The Evolution of North American Rhinoceroses, Cambridge University Press, Cambridge, p. 2, 2005. Return to text.